Do you want to use your vehicle to increase your brand and business visibility, but need an option that allows you to advertise when you want to? Custom vehicle magnets by Dallas Sign Company are your solution! Vehicle magnets are a cost-effective way to advertise your business on the go. 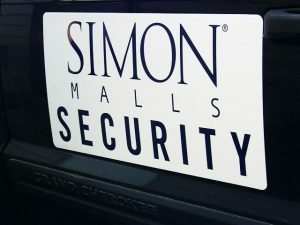 You can add your magnet to your vehicle when you need to increase your business visibility, and remove it when you want. If you live in a signage restricted area or want to drive a little bit faster on your personal time, there is no better advertising tool that provides these options than a vehicle magnet. As your local full-service signage shop, Dallas Sign Company handles every aspect of the vehicle magnet process. Aside from offering expert fabrication services, we also provide professional design and installation services for all of your signage needs. We provide the attractive, affordable solutions you need, tailored to your unique brand and business, and in the timeframe, you need it in. So when you’re looking for a reliable signage partner, Dallas Sign Company is the right choice! Call Dallas Sign Company today at (214) 256-1189 for your Free Consultation! In today’s tough economy, your business needs to arm itself with every advertising tool available. From attractive exterior signs to cohesive interior signs, and mobile advertisement designed to get your customers to look up from their devices and take notice of your business and brand. If your customers aren’t given the opportunity to learn about your business, then they never learn about how your products and services will make their lives better. With vehicle magnets, you can easily advertise your business on the go. As you go about your standard daily routine, your vehicle magnet will promote your business, everywhere you go. Reach a greater audience within your community and inform them that your business exists and can provide them with outstanding products and services. Best of all, when you are on your time, or you need to switch vehicles, you can quickly remove and reapply your magnet when you’re ready! 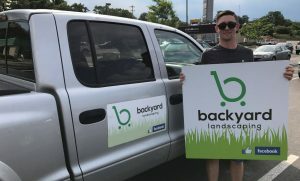 Dallas Sign Company has the tools, knowledge, and experience required to deliver the eye-catching vehicle magnets that get your brand noticed! Depending on where you live, a deed restriction or an HOA (homeowners associations) restriction may limit signage within your neighborhood. These types of restrictions can often make it difficult for business owners to utilize their vehicles for brand and business promotion. Effectively making your vehicle just like any other vehicle around you, permanently crippling your ability to advertise your business in an affordable manner and in a way that has been proven to garner more attention than the more expensive advertising forms. With vehicle magnets, you can bypass those restrictive covenants, and simply add your vehicle magnet as needed. 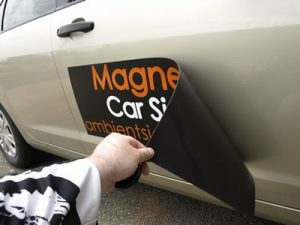 Affordable and easy to remove and add, vehicle magnets are our least labor intensive option. Our graphic designers can design a vehicle magnet that allows you to take advantage of your vehicle for advertising while staying within the boundaries of any restrictive covenant. Dallas Sign Company is a full-service sign company. That means we handle every aspect of your signage project, including professional design, fabrication, and installation. We begin with a free consultation where our knowledgeable sign experts discuss your ideas, goals, and needs. Our goal is to provide affordable, effective signage solutions that help you meet your business signage needs, and the best way to do that is for us to understand your brand and business. Once we understand your goals and what you need on your project, our talented team of graphic designers will begin developing digital proofs for you to review. These proofs are a great way for you to see what your project will look like and allow you to make any edits you wish, including the size, shape, text, colors, and fonts. After you have approved your final design, our fabrication team will quickly and efficiently manufacture your project. Working alongside our graphic designers, we ensure that your project will match your approved proof, as well as your budget and timeframe. While vehicle magnets don’t require a professional installation, we also offer repair and maintenance services for all of our signage products as well as those created by others. If you have a sign that’s in need of repair or replacement, we can handle that as well! 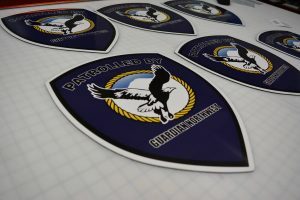 We not only design and fabricate vehicle magnets, we also custom make every type of interior and exterior signs you can imagine. Our sign consultants and project managers are always available to discuss any signage needs you have, so stop by our store and discuss your business and marketing goals today! Choosing the right signage partner is essential when it comes to getting the right solutions for your brand and business needs. We have the tools, skills, and experience needed to deliver the solutions your business needs to achieve its signage goals. With excellent customer support and superior sign and graphic solutions, Dallas Sign Company is the right choice for all of your personal and commercial signage needs. We look forward to helping your business grow and reach new market success. Call Dallas Sign Company today at (214) 256-1189 for your Free Consultation with a Vehicle Magnet Expert! A gentleman that help me was GREAT and his name is Mr.John Malone.